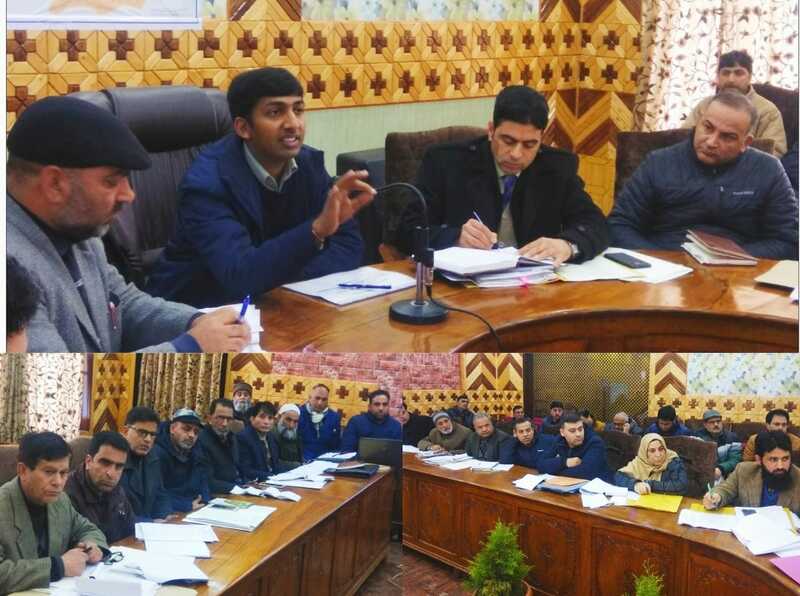 KUPWARA March, 07: Deputy Commissioner Kupwara , Anshul Garg (IAS) today chaired a meeting with the senior officers of the Rural Development Department ( RDD) to review the functioning and progress achieved under various flagship schemes and developmental programmes of the Department. The meeting was attended by ADDC Kupwara, Assistant Commissioner Development, District Information Officer, BDOs and other senior officers of the concerned department. During the meeting, various issues particularly sanctions made under PMAY SBM, MGNREGA and convergence of MGNREGA with other schemes and sectors also came up for discussion. While addressing the meeting the DDC urged upon all concerned officers, agencies to achieve the given out targets of all sectors before the expiry of the current financial. He said rural development is mandated to uplift the living conditions of poor and underprivileged communities. DDC , while reviewing the performance directed the officers to mobilise their men and machinery for public service and to redress the public grievances at an earliest. He said all BDOs shall routinely visit their concerned areas, in addition he urged upon the BDOs to demonstrate their desire and commitment in implementing all the schemes/flagship programmes in letter and spirit. DDC directed ACD to make awareness among BDOs regarding FTO, Geo tagging and furnish the daily based progress reports uploaded on MIS. He directed BDOs to monitor all the works taken up under various schemes and check the status of Geo Tagging on ground. He also said that ADDC will monitor the overall work of Rural Development Department.